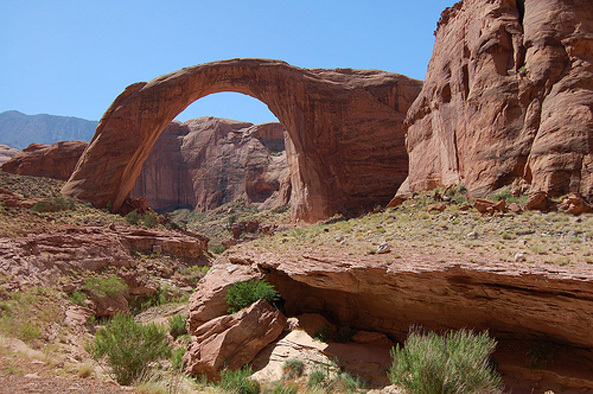 In the past, Rainbow Bridge stood over a small tributary stream of the Colorado River near the Arizona-Utah border. The Bridge and the area around it has been considered sacred by the Dine, Paiute, Hopi, and others for centuries. Large enough to fit the U.S. Capitol dome beneath its sandstone arch, it was designated a National Monument in 1910 by President Theodore Roosevelt. In 1956, Congress authorized the Glen Canyon Dam to fill the Lake Powell Reservoir, but only on the condition that the water level not go high enough to reach the monument. By 1971, the water had reached the monument. A court case filed under the American Indian Religious Freedom Act was lost and failed to protect the site. The reservoir, which covers up many sacred sites around Rainbow Bridge, is used for tour boat cruises and to provide access to the bridge for the tourists. The water is filled with trash, petroleum, pollution, and human waste. The National Park Service and the Navajo Nation have proposed building a $70 million new marina (under the auspices of the Glen Canyon National Recreation Area) along the shoreline of Lake Powell, which will increase tourist traffic and do further harm to the area’s qualities. In addition, full environmental studies have not been conducted on the impacts of the marina project. As of March 2003, the project is on hold because the reservoir’s water level has dropped so low. The Navajo Nation sees the dam as essential to its plans for economic development; however many Dine question the Nation’s reliance on the dam and its willingness to forego responsibility for the area’s sacred sites. In addition, the National Park Service was sued in April 2001 by the conservative Mountain States Legal Foundation for posting signs that ask visitors not to walk under or near the bridge out of respect. The MSLF claimed that the signs promoted Native religions in violation of the U.S. Constitution. On April 19, 2002, a federal judge in Utah upheld the National Park Service’s policy, saying that it is in line with the American Indian Religious Freedom Act, which requires the government to “protect and preserve for American Indians their inherent right to believe, express and exercise …” their traditional beliefs. MSLF appealed and received another rejection from the Tenth Circuit Court of Appeals on March 23, 2004. A panel of three judges ruled that the plaintiffs did not show that they were harmed by their lack of access to the bridge and could not sue the National Park Service for violation of constitutional rights. A coalition of indigenous and environmental groups are calling for the Glen Canyon Dam to be drained, returning the water to its natural level and uncovering the sacred sites currently beneath the water. The full intention of the National Monument status should be invoked and the new marina project should be stopped. Tourism should be limited to a manageable number and visitors should be informed about the need to preserve the Rainbow Bridge area as a sacred place. Rainbow Bridge National Monument website. “Judge: Park Signs Don’t Promote Indian Beliefs.” Salt Lake Tribune, April 19, 2002. “Group’s challenge to sacred site policy rejected.” Indianz.com, March 31, 2004.